Did I make myself a treat a few days ago! Strukle (it is not spelled this way, but with a Croatian letter that makes the sound sh, which I don't have on this keyboard, you read it sh-t-ru-k-lee) are a Northern Croatian specialty. I have only eaten them made from scratch and fresh a couple of times in my life myself. That is because you can find a perfectly wonderful package of frozen ones in every store on every corner in Croatia, and it is so much easier to just throw a few of them into a boiling water than to go through the trouble of making the dough and STRETCHING it yourself!!! Eeeeeeeeeeeek. Well, I am not afraid to do the dough myself! Being a few thousands miles from home and first store that carries something that you are craving insanely will do that to you. It was actually very easy to make it, once I was determined and had the necessary patience with stretching the dough (which you can use btw for making strudels and such, just omit the amount of salt). First of all, put a large pot into the oven or if you can't boil some water(not too much) in a large pot on the stove top to make the pot hot. You will cover your dough with it once kneaded for half an hour. You will need to add water as you go, the goal is to get the dough to pizza like consistency. Stretchy and soft, but not sticky anymore. I sift the flour on my island and with fingers make a little hole in the flour "hill". Inside I put the egg and some oil (this time I used 1tbsp of melted and cooled butter and 1 tbsp) and start incorporating flour into it, slowly add water until all the flour is mixed and the dough is not sticky anymore. You want to put some air in it so knead it until you see or hear some bubbles. 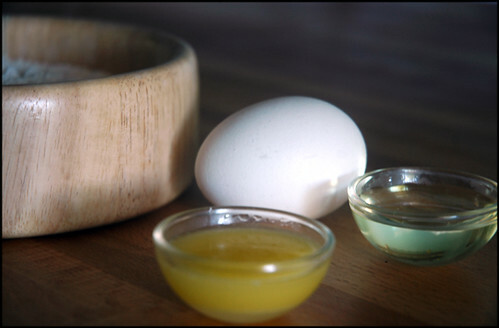 Once done shape it into a ball and brush it with some oil. Cover with the hot pot for 30 minutes. While waiting, prepare the filling. Mix all the ingredients together and strain 3/4 of the mixture. 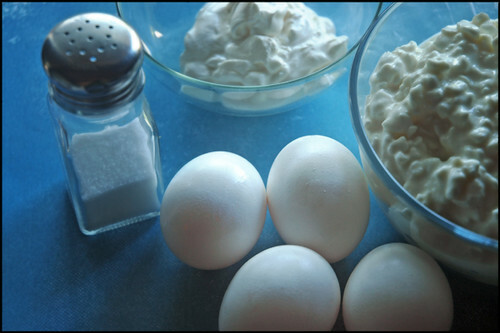 What you will now have is cottage cheese mix that you will put back with the 1/4 of the beginning mixture, that you use as a filling. 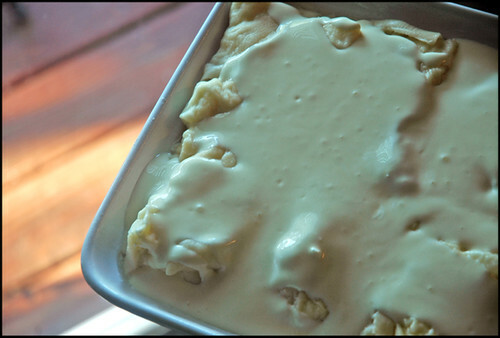 The other drained part is what you will put on the top of strukle before baking them in the oven. 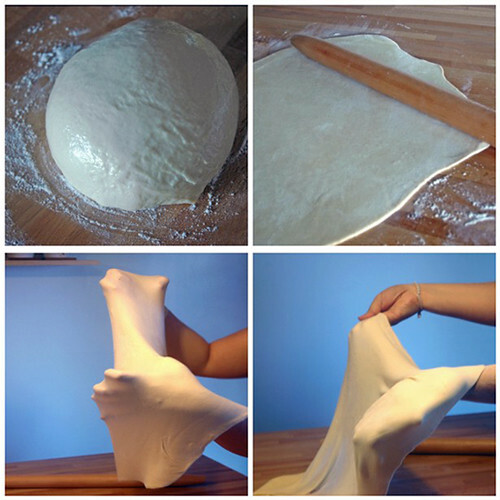 Roll the dough out as much as you can before you start stretching it with your hands. Make sure that your working surface and hands are well floured. Gently lift the dough with your palms, make fists and make start stretching it in circular movements. Once you think it's thin enough, specially around the middle, return it to your working surface and start stretching it out there. You should be able to get at least a 3'x4' piece of stretched dough. It is normal that it will brake at some pieces, but that shouldn't worry you, just stitch it up. When you have sort of transparent like filo looking dough, you are done. Spread the filling evenly over the entire dough except the first and last 2 inches of it from where you are starting to roll. Once rolled you will have a big doughy snake. Cut it with a little plate, it will help seal little pockets that you are making, even though it is likely they will reopen while cooking. This is why you will cook them in steamy but not fully boiling water, so you lose as little filling as possible. 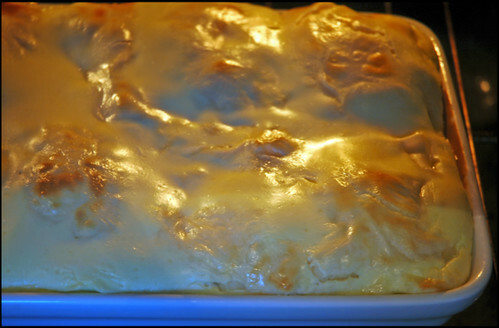 Arange strukle in a baking dish and pour the rest of your filling, the liquidy stuff, over the top. Put in the oven on 425 F for 20 min or until deep golden brown. Taaaa-daaaaa. I am so proud of me. I will be so proud of anyone else who makes it! I did my very own home-made strukle. I must be going insane with this cooking thing! Strukle are very mild in flavor, but they are truly a comfort food. 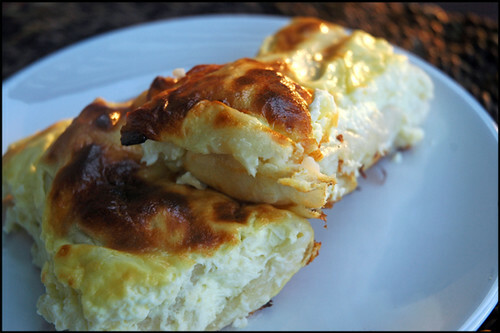 If you ever had a cheese bourek or savory cheese strudel, that is the closest to what I would compare it to. Except this one is not the crispy and flaky dough. There is NOTHING wrong with crispy and flaky, hey I prefer it. 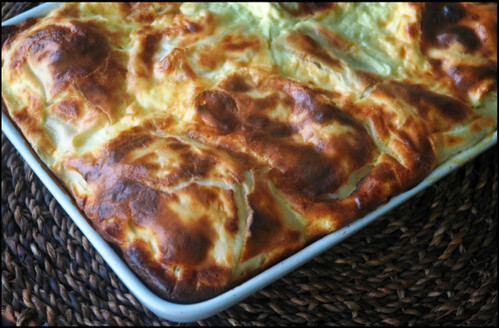 But sometimes you just need strukle, warm and cheesy,soft and comforting little pockets of goodness! kao da si u zagorju! Wow, divne strukle! Probacu po tvom receptu. Bas u trazenju po netu, dodjoh do tvog bloga, divan je. Drago mi je da sam nasla i ove strane. Pozdrav! 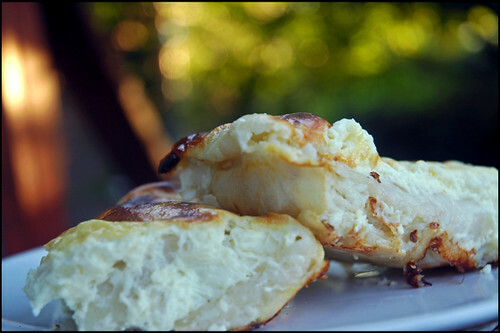 I'm Slovenian, and I grew up eating homemade strukle but with a slightly different variation. 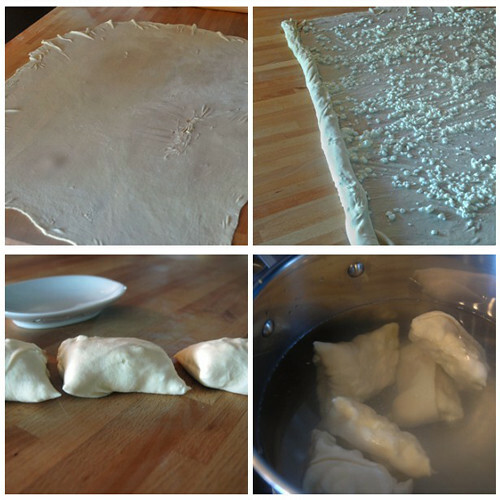 Stretch the dough out as thin as possible on a floured table cloth. Generously drizzle the surface with streams of melted butter or margarine, then use your thoroughly washed hand to spread it over the rolled dough except about 6 inches from what will be the "outside" end of the roll. Sprinkle the entire surface with fine ground black pepper. Pick up the end of the table cloth at the "inside" end of the roll, and simply pull it upward to roll it up into a long snake. Coil the snake and drop it into slow boiling water for about 45 minutes. Drain the water, cut off a piece and enjoy! Thank you everyone for your comments, and this last comment, interesting version! I don't understand, do you boil them and then put them in the oven? How long do you boil them for? You can just boil them and serve as is, or first cook them and then also bake them in the oven like I did. They cook on the stove top first either way for about 15 to 20 minutes, and only a few at a time! Got it. Thank you so much for the quick response. Love your recipes.